Water and Wastewater Treatment Authority workers clear a stand pipe at the Snow Hill pump station Friday, November 2, 2018 in Ooltewah, Tennessee, after clogs caused a massive sewer overflow in the 7600 block of Snow Hill Road last weekend. The spill went into nearby creeks and across some paths of the nearby Champions Golf Course. A halt to new sewer connections in the burgeoning Ooltewah area is possible after Hamilton County's sewer authority illegally released 2 million gallons of raw sewage into Rogers Creek in just one year. In a letter dated Thursday, the Tennessee Department of Environment and Conservation wrote to Water and Wastewater Treatment Authority Executive Director Mark Harrison that 29 sanitary sewer overflows had occurred from October 2017 to the present. One of those overflows happened last weekend at the Snow Hill pump station, sending raw sewage into the creek and across some paths of the nearby Champions Golf Course. Read the Tennessee Department of Environment and Conservation letter. "To maintain compliance with your permit, you must implement a self-imposed moratorium in this area," wrote Jennifer Innes, project manager with the Division of Water Resources. In effect, that would mean no new sewer connections in the fastest-growing part of Hamilton County. The TDEC letter follows a federal lawsuit filed this week against the WWTA by the Tennessee Riverkeepers over some 20 million gallons of sewage illegally discharged from the Signal Mountain wastewater treatment plant to the Tennessee River since 2013. The lawsuit says the Alabama-based environmental group may seek to stop WWTA from operating the plant, and it could seek fines of $37,500 a day each for hundreds of spills, overflows and bypasses. Mike Moon, chairman of the WWTA board, said in a statement that "If the intent of the lawsuit is to bring attention to the issue, we applaud the action to raise awareness." "However, if the intent is for a financial settlement for the Riverkeepers, we find this counterproductive to fixing the problem and it would place an undue burden on our rate payers. We will always vigorously fight to minimize the cost to our customers from such actions," Moon said. WWTA Executive Director Mark Harrison acknowledged the violations Friday, saying the authority has decades of unaddressed maintenance and capacity shortfalls on which to catch up. "The message is that we have put rehabilitation off as a community for too long. It's going to take us a little while to fix it, but we do have a plan and we are taking necessary measures," Harrison said. 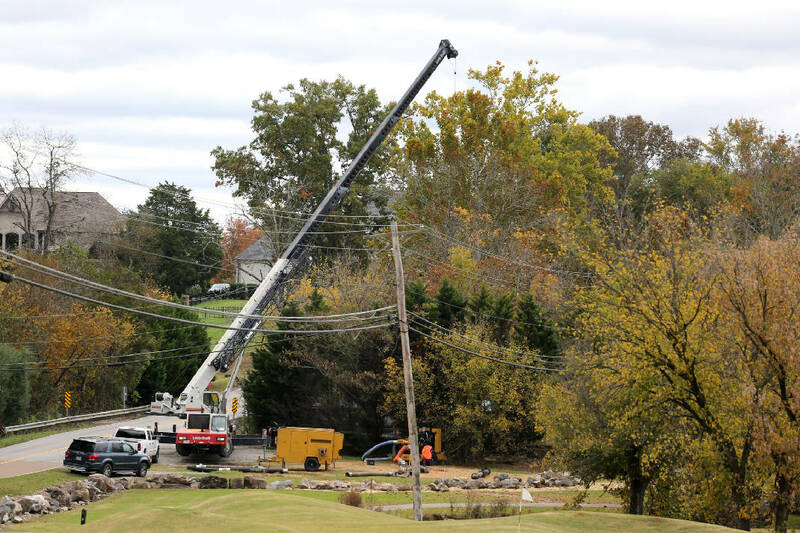 Part of the problem, he added, was a lack of political will to raise sewer rates enough to pay for some $200 million in necessary repairs, including an estimated $28 million on Signal Mountain and $85 million in the Ooltewah basin. But the rate reluctance is coming to an end and sewer customers are going to start paying more as the authority ramps up its systemwide rehabilitation plan. Harrison believes the agency can stave off a moratorium by showing TDEC what it has done and is doing to stop the Ooltewah overflows or reduce them to fewer than five a year, the legal limit. The WWTA has been working for some years to add a new force main pipeline for discharging wastewater and reorient collection lines to halve sewage flows to the Snow Hill and Rogers Creek pump stations. That $13 million project will be finished in about a year, he added. The problem on Signal Mountain — and many other areas, especially in older municipal systems — is surface water infiltrating sewer lines and boosting the flows so high the sewer plant won't handle them. In those cases, he said, the WWTA bypasses the plant, treats the water with chlorine and releases it into the Tennessee River. "Fixing the collection system and building storage are the two approaches to solving the problem in Signal Mountain," he said. Signal Mountain has been operating under a TDEC moratorium since 2007. Moon said in his statement the authority is working with the U.S. Environmental Protection Agency, TDEC and others on a "comprehensive plan to address the issues surrounding bypasses that occur during significant weather events" at the Signal Mountain plant. The lawsuit and notice of violation were more fuel for neighbors who have organized to oppose WWTA's plan to build a new sewage treatment plant on Mahan Gap Road in the Ooltewah basin. "The culture of WWTA, they have a real lack of accountability to the ratepayers and the citizens of Hamilton County," said Jennifer McDonald, representing the neighbors' group called North Hamilton County United for Responsible Growth. "I understand this is an inherited problem, but problems such as these have been going on for years," McDonald said. "Now that there's press attention and political pressure from everyone having eyes on this area due to the sewage plant, I hope they will follow through on adequate repairs for this area." Ninth District County Commissioner Chester Bankston shares his constituents' fury over putting a sewer plant in an area with 3,500 homes and two elementary schools. He doesn't understand why WWTA won't move it farther north, saying there are 100 acres for sale near the Meigs County line. "You're going to sewer the whole county anyway, why not move it up north?" Bankston said. He'd like to see the whole thing solved by turning WWTA over to the Tennessee American Water Co. Bankston said Tennessee American called him to talk about the idea. "Tennessee American has the money, the backer and investors, they can do it a whole lot faster," he said. According to Tennessee American Water Co. spokeswoman Daphne Kirksey, the company is not in active discussions with either Hamilton County or WWTA. "We have provided quality water service in the Chattanooga area for over 130 years. We are always open to opportunities and to assist where possible," she said. Bankston said that if TDEC slaps a moratorium on WWTA, "it's going to slow it [a sewer plant] down." "That's why we need to get something done, stop messing around with this site that I don't think is going to work."